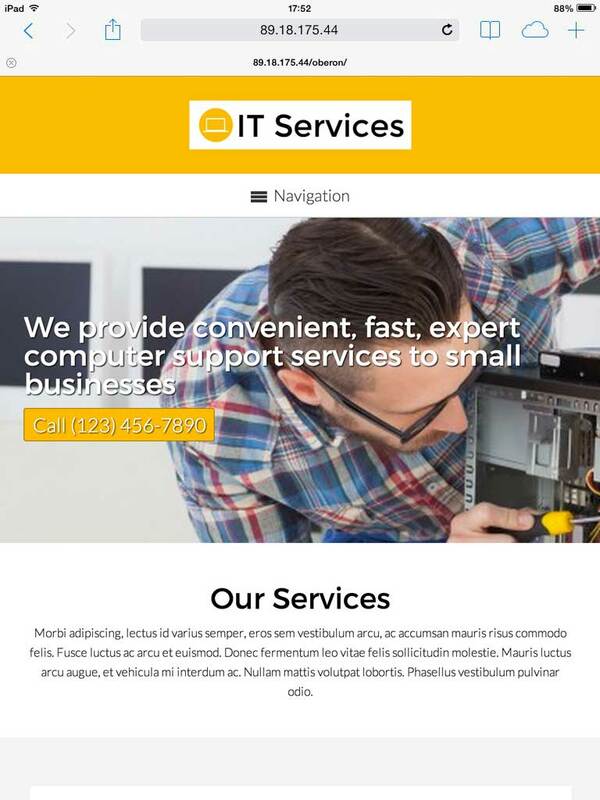 With the IT Services WordPress theme, everything you need to create a professional website for your IT business is already set up and waiting for your own text and photos. 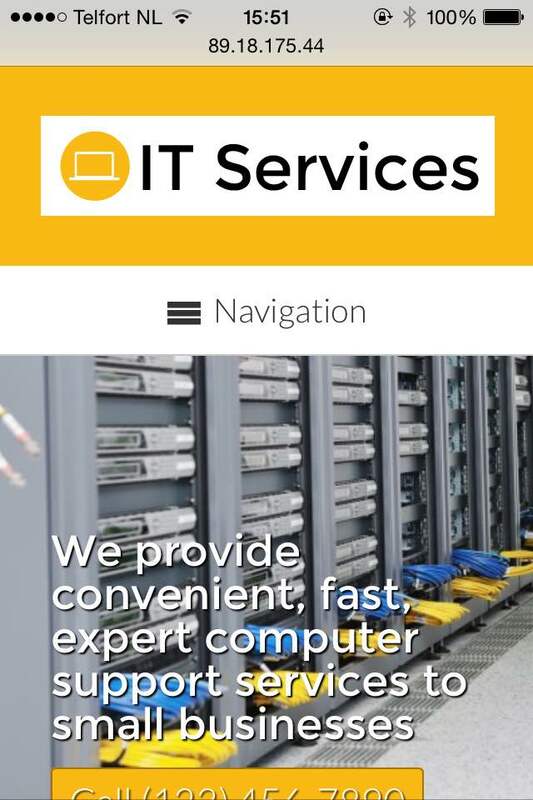 We've made it easier than ever to get your IT services online fast without any coding at all! As a tech professional you know the importance of having an impressive online presence that gives clients confidence in your business. 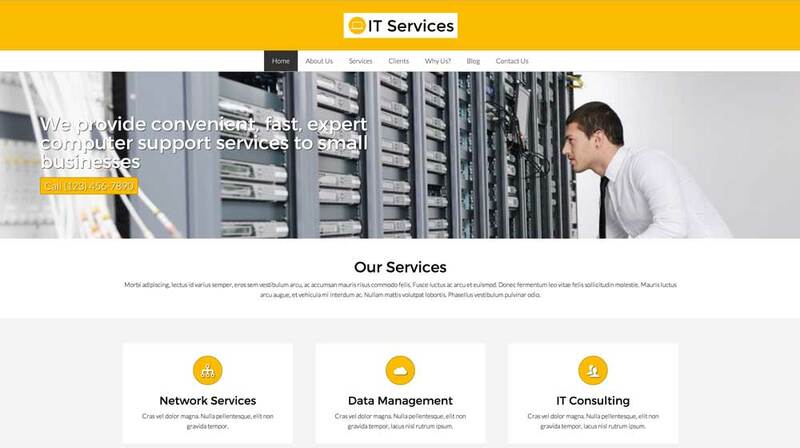 That's why we've designed the IT Services WordPress theme with a bright, clean layout and user-friendly navigation that helps you present your IT company in the best light. Just fill in your own text and images to offer visitors details about your services, a company profile, online quote requests and the latest news about your business. No coding is required to customize your website with your signature colors, adjust page layouts or add features like a Twitter feed or lightbox image gallery. Our unique front-end editor lets you style your site with just a few clicks, and drag and drop widgets make it simple to add or move blocks of content. 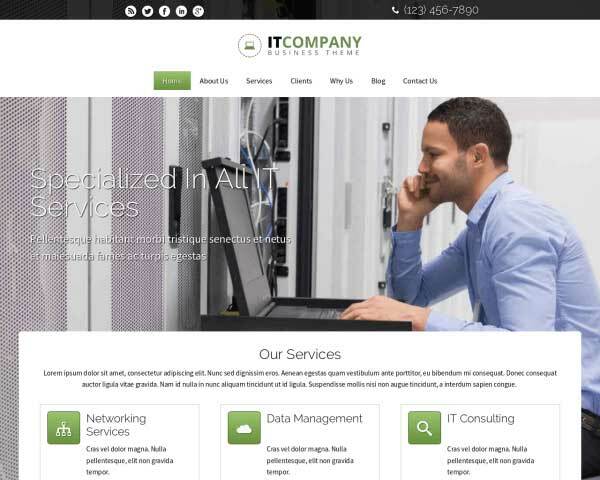 This pre-built website template for IT companies comes with premium features like a helpful SEO manager, integrated social media, and built-in contact forms that can be easily customized to suit your needs. 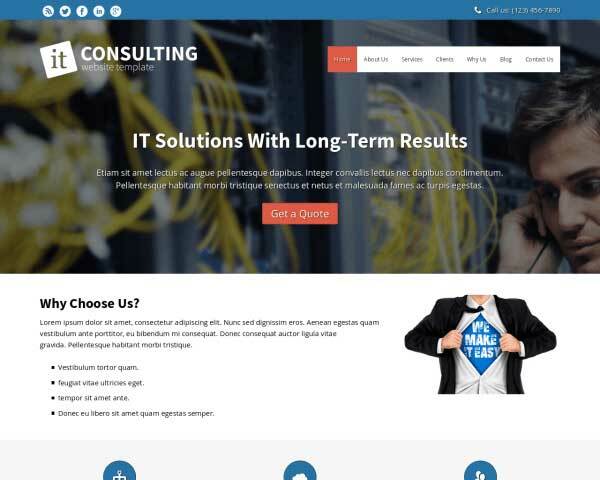 Take a look at the demo site and try it risk free for three days to see how the IT Services WordPress theme can help you boost your IT business with an exciting new website! 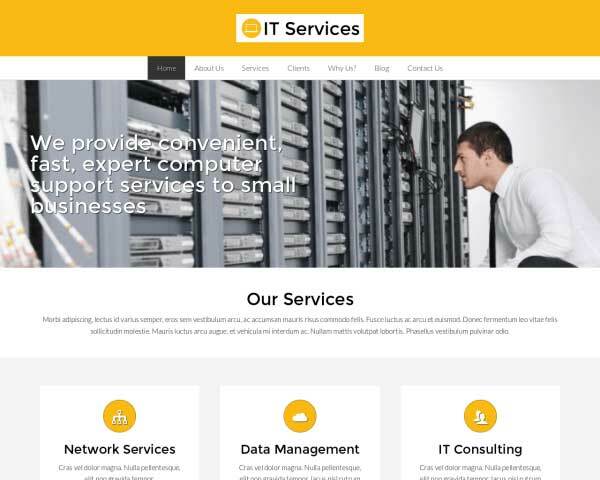 This IT Services WordPress Theme wouldn't be complete with a section to feature article, tips and news about your organization. So it's there for you to use as you please. 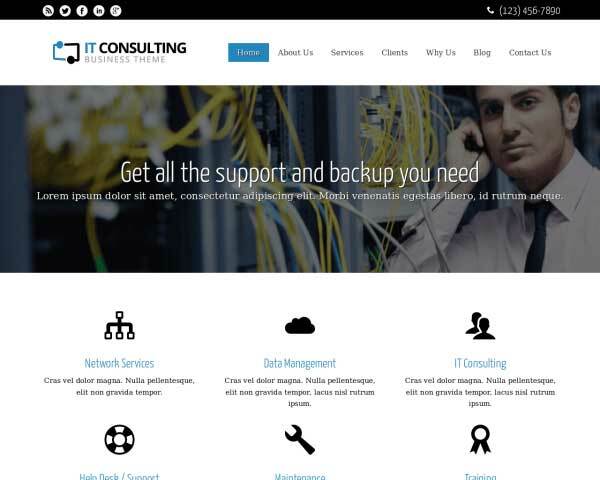 The IT Services WordPress Theme was designed specifically for it consultants. So chances are that anything your software website might need is already there - at your fingertips! A classic image slider is included on the homepage in the IT Services WordPress Theme, grabbing visitors' attention right from the start. No website can do without a contact form. The IT Services WordPress Theme is no exception to this rule, hence we've included the necessary elements to make a quality contact section. Display an overview of your favorite projects with thumbnails that feature a cool hover effect and link to pages with more details about each portfolio item. 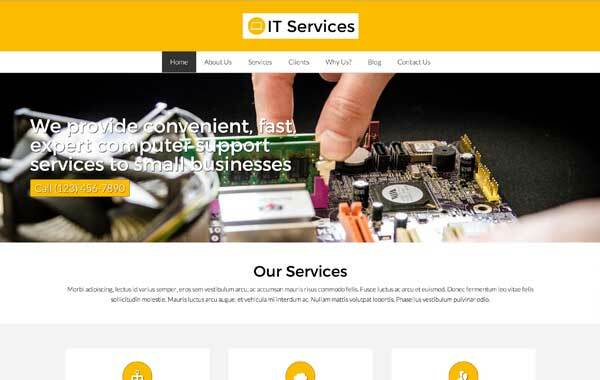 The IT Services WordPress Theme comes packaged with sharing and following icons for popular social media platforms, and widgets that display a Facebook or Twitter feed. Trust is probably one of the most important factors for a software company. Gaining trust can be achieved with the help of the team overview page. Convince visitors of your IT company's tech savviness with one glance through a website that looks great and works perfectly even on small screens. When you start with the responsive IT Services WordPress theme, a sleek mobile version of your website is part of the package! Optimized for all handheld devices, this website template will automatically detect the capabilities of each device and adjust the layout of your content to render beautifully on any screen size. Mobile visitors will enjoy the same professional design and functionality of the desktop version, plus the added convenience of simply tapping on your phone number to dial or tapping your email to open a new draft.